Why pay more when you can pay less using these housing grants? 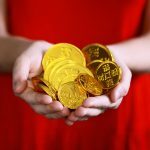 This article was updated on 12 February 2018 to include updated information. 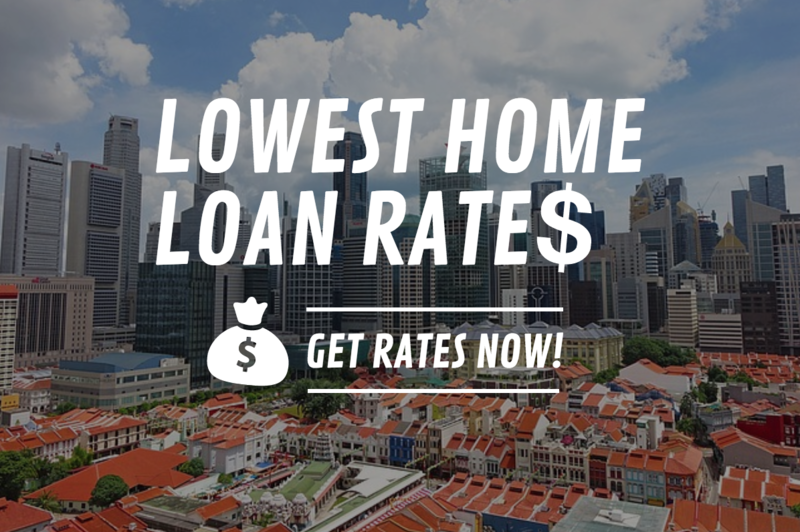 In Singapore, buying a HDB flat is one of the major financial decisions that most of us have to make, and usually requires a housing loan. As such, being familiar with the various housing grants available is important, as it can potentially help you save quite a sum of money. In this article, we will explain the different housing grants available, the eligibility criteria for them, and how much Singaporeans can expect to receive. Meant for lower and middle-income families, the Additional CPF Housing Grant (AHG) allows families buying their first HDB flat to receive a grant of up to $40,000. This grant can be used for the purchase of both new and resale flats. To qualify for this grant, applicants have to meet the following conditions. One: At least 1 of the applicants must have *worked continuously for 12 months prior to the flat application, and still be employed at the point of flat application. *From May 2018 sales exercise onwards, young couples may apply for a flat first, and defer the income assessment for the Additional CPF Housing Grant, Special CPF Housing Grant, and HDB housing loan. Couples who fulfil the eligibility conditions may have their income assessed nearer to their key collection appointment. Find out more here. Two: Monthly household income up to $5,000. Actual grant given will depend on actual income, with lower-income households receiving a higher amount. It is possible that one applicant may have been working continuously for more than a year, while their partner is still in school, or is not working. Under such circumstances, homebuyers will qualify for the grant if the gross income of the person working is $5,000 or less. Similar to the AHG, the Special CPF Housing Grant (SHG) is a grant designed to help lower and middle-income families in Singapore buy their first HDB flat. However, the SHG can only be used for the purchase of 4-room or smaller new flats in non-mature estates. The SHG is given on top of the AHG, which means homeowners can enjoy both grants if they are eligible. The following conditions must be met. One: Similar to the AHG, at least 1 of the applicants must have *worked continuously for the 12 months prior to the flat application and still be employed at the point of flat application. Two: Monthly household income of up to $8,500. Actual grant given will depend on actual income, with lower-income households receiving a higher amount. Three: As stated above, the SHG is only applicable for those buying a 4-room or smaller new flat in a non-mature estate. It’s not applicable for resale flats, new flats in mature estates, or 5-room or larger new flats in non-mature estates. For those who are potentially eligible for the SHG (i.e. combined monthly income up to $8,500), you may want to consider applying for a 4-room or smaller new flat in a non-mature estate to enjoy the SHG. Here is a screenshot from the HDB website that shows the total grant one can expect to receive from both the AHG and SHG. For those earning $1,500 and below, they can receive as much as $80,000 in grants! Both applicants are working and have a combined monthly household income of $4,000. As such, they are entitled to a grant of $15,000 from the AHG. If they were to apply for a 4-room or smaller new flat in a non-mature estate, they will enjoy an additional $40,000 grant from the SHG. 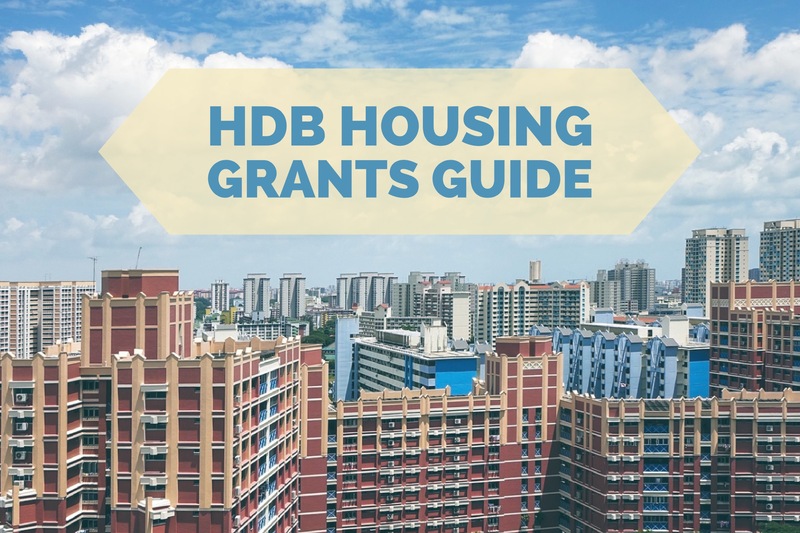 For those who choose to buy a HDB resale flat or Executive Condominium, there are also housing grants available. One of them is the CPF Housing Grant for resale flats. It provides first-time homeowners earning up to $12,000 and buying a resale flat a grant of $50,000 for 4-room and smaller flats and $40,000 for 5-room or larger flats. If your monthly household income is $5,000 or less, you could also apply for the AHG. For those considering an Executive Condominium (EC), they are also able to apply for the CPF Housing Grant. The full grant amount of $30,000 is given for households with a monthly income of $10,000 or less. Household with a monthly income of $10,001 to $11,000 will receive $20,000, with $10,000 given to households with a monthly income of $11,001 to $12,000. A family with a combined monthly household income of $4,500 a month that buys a 4-room resale flat would be eligible for the CPF Housing Grant of $50,000, and the AHG of $10,000. In total, they will receive a total grant amount of $60,000. Grant Amount: $20,000 if you live within 4km of where your parents/child are staying. $30,000 if you stay with your parents/child. Who is eligible: Homeowners buying resale flats in the same town or within 4km of where their parents are staying, or who will be living in the same flat. If you are buying a resale flat within 4km of where your parents/child are staying, or are intending to stay with them in the same flat, you will be eligible for the Proximity Housing Grant (PHG) of up to $30,000. 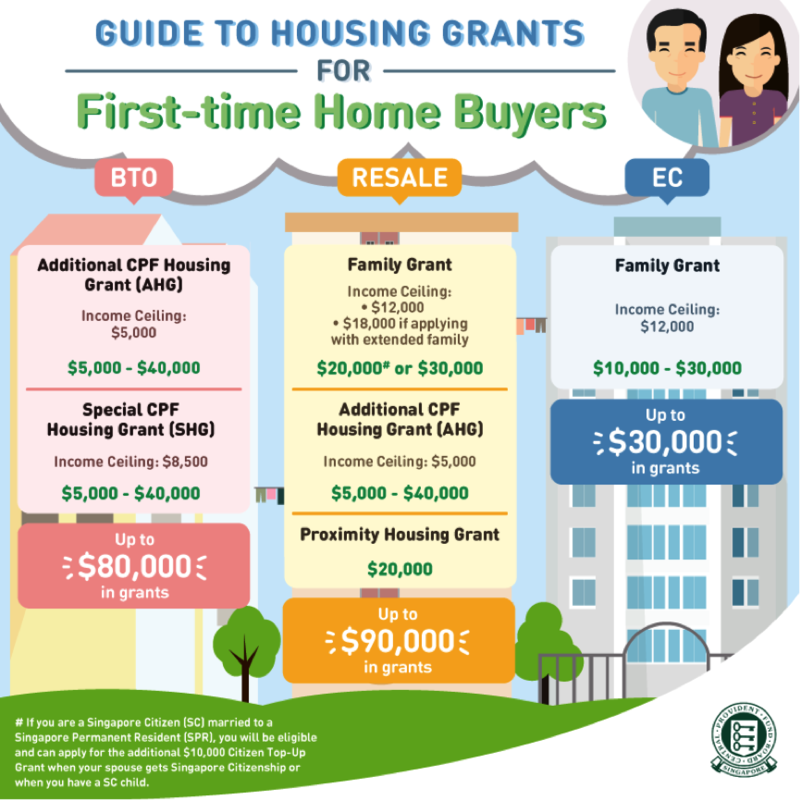 For first-time homebuyers earning up to $12,000, the PHG is given in addition to the CPF Housing Grant (Resale flat) and the AHG. Unlike the CPF Housing Grant and AHG, the PHG does not have an income ceiling and is not restricted to just first-time homebuyers. This means that almost all homebuyers will be helped when buying a flat to live with or close to their parents for mutual care and support. 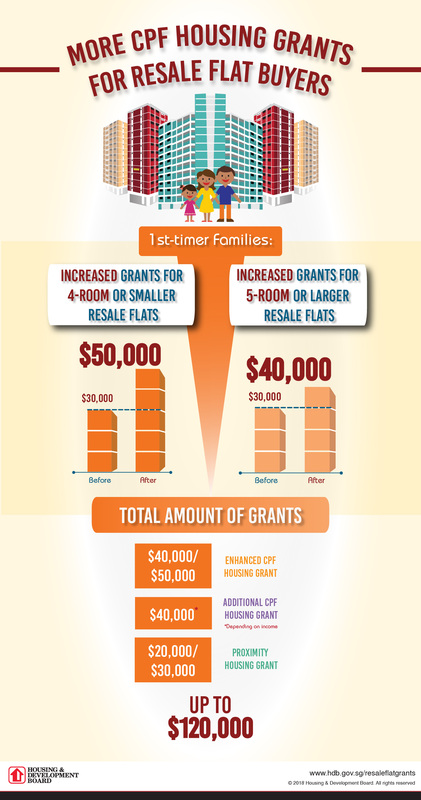 The various grants available can help us substantially reduce the cost of buying our first home. As such, it makes complete sense to first understand what all these grants are, and to have a discussion with your partner on how these grants could help you in deciding the type of flat that you should go for.